What Is the Difference Between Latex & Foam? What Makes the Softest Pillow? When to Replace an Egg Crate Foam? Egg crate foam is a popular solution for packaging goods and controlling acoustics. Its undulating texture has also made it a well-liked bedding support. Since the design of an egg crate mattress pad hugs the contours of an individual's body, it is said to promote a more restful sleep. Just like all foam products, egg crate foam will ultimately wear out from use and will need to be replaced. Although its texture will inevitably deteriorate, egg crate foam will last longer if it is properly cared for and maintained. Egg crate foam begins to discolor once it's exposed to light. Due to a photochemical reaction, it will turn progressively more yellow over time. This process is hastened by natural sunlight, but artificial light will eventually produce the same effect. However, discoloration is an outward change and it does not affect the foam's longevity. The cellular structure of egg crate foam will ultimately collapse, and as the material disintegrates it will stiffen and crumble. 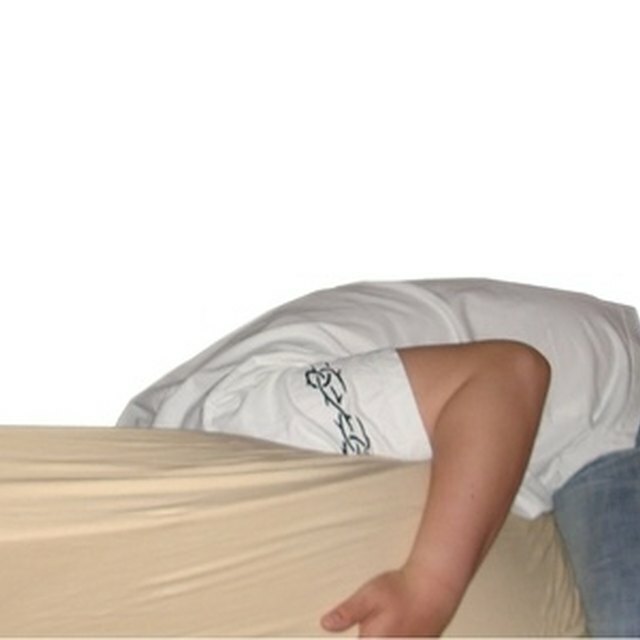 An egg crate mattress topper can break down more easily because of its function. Since they typically have a thickness of 1 to 2 inches, they are too thin to withstand long -term use. As the superficial layers of foam give way to body weight, there is less material to compensate for their loss and provide support. Since heavier individuals exert more pressure egg crate foam, they are likely to wear out the material sooner. An egg crate foam mattress pad typically lasts anywhere from 18 to 36 months. You can postpone replacing egg crate foam by keeping the material clean. Periodical cleaning of egg crate foam will rid it of foreign particles that can contribute to its deterioration. Vacuum the egg crate foam to extract impurities like dirt, pet dander and dust mites from the pores. Steam clean the egg crate foam to lift deep-set grime. Egg crate foam is a flimsy material that cannot endure conventional cleaning processes. It cannot be laundered in a washing machine and it will melt in the dryer. If the egg crate foam ever gets wet, make sure it dries adequately in the open air. If it does not dry properly, bacteria can grow and destroy the foam. Generally speaking, more expensive varieties of egg crate foam are fortified to last longer and some may even contain antimicrobial additives. While economically priced egg crate foam is common, it will surely wear out and need to be replaced sooner. Based in New York City, I am an online video producer who has more than five years of experience working in digital media. I specialize in video compression and distribution, video software, online video sharing and portable device use. I received my B.A. in Film Studies in 2005 from Vassar College. What Are the Benefits of Latex Beds and Pillows? Where Does a Foam Mattress Pad Go on My Bed? What Are the Benefits of a Plush Mattress? What Are the Dangers of Sleeping on a Latex Topper? What Is Ild in Mattresses?